Deep Fried Sweet Potato Balls filled with Red Bean Paste – a delicious street food best enjoyed with a strong oolong tea like teanamu’s Wuyi Shuixian. It is that time of the year again when I am packing my bags to get ready to go to Singapore in time for the Chinese New Year. As I look at the year that has gone past (again! ), I am grateful for the opportunity to meet so many lovely tea friends and I look forward to meeting more friends at the tea open houses and other events that I will be hosting. All these nostalgic emotions and the cold weather are make me hungry. As I sit here thinking about all the Chinese New Year goodies that I will be indulging myself in Singapore, one particular street food pops into my mind and that is Jian Dui (translated as a deep fried ball). 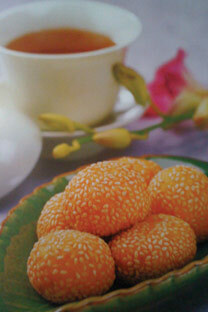 Jian Dui is a sweet potato ball filled with red bean paste that has been coated with sesame seeds and deep fried. While many might recognise this as a Cantonese snack, it is also very popular amongst ethnic Hainanese like myself. In Hainan where my grandparents came from, this street food is also affectionately known “treasure bag” and is a must have item in many celebratory occasions. Jian Dui has many origins but most likely it can be traced all the way back to the Tang Dynasty where a buddhist poet from the early Tang dynasty Wang Fanzhi praising it in a poem! Apparently, Chinese people from that era liked to buy Jian Dui served on a stick while they did their new year shopping in busy crowded streets. Now the trick to making perfect looking sesame balls is to make sure that the oil is not too hot. If the oil is too hot, the dough will swell up with air and may burst or burnt very easily. However, if the oil is not hot enough then the dough will become chewy. I like to eat these Jian Dui accompanied by a darker Oolong tea like Wuyi Shuixian which is strong, full-bodied and has spectacular orchid-like fragrance and a delicious, natural sweetness reminiscent of dried longan fruits. The floral, sweet fruit and roasty profiles of this tea goes particularly well with these piping hot sesame, sweet potato and red bean paste. As I write this blog, my mind is wondering about the idea of making Jian Dui with some oolong tea and simply fry the balls without a filling. – Peel the sweet potato and cut into chunks. Steam the potato chunks till soft and mash till fine. – While the sweet potato mash is still hot, fold in the sifted glutinous rice flour and sugar. Leave to cool slightly and then knead into dough. – Divide the dough and the red bean paste into 20 portions. Flatten a piece of dough and wrap it around the mung bean paste to form a ball. – Brush all round with some water and coat with in sesame seeds. – Serve hot with a good strong oolong tea! ** This will make about 20 ping pong sized sweet potato balls. With my last blog post in the year of the Bull, I wish all of you a very happy and prosperous year of Tiger! LOVEit! Thanks for the recipe. Safe travels and Happy New Year! Oh! Jan Dui is one of my very favourite things… I never even thought about making my own! I was away for Chinese New Year so my apologies for not wishing you a happy new year in good time but better late than never. Jian Dui is not difficult to make but is only nice if eaten fresh. Thanks v much for the new year wishes.